Summatime! We’re in the thick of it. It’s a little foggy here in San Francisco, but that doesn’t stop us from taking part in the rituals of the season. We eat peaches. We drink cold wine. We wear maxi dresses with alarming frequency. No matter where you live, there are certain things that make summer feel more like summer — let’s make a list, shall we? 1. Trips! Road and bike and plane. For me, Summer is trips to Gramma’s house by the beach in Montauk, NY. A long way from California, but well worth it for the chance to eat fried clams, swing in the fraying hammock and watch your niece refuse to show her tiny face in the big girl pool. 2. Books. Maybe it’s because of the trips and the beaches, but I always find more time to read in summer. My two current favorites are: Where’d You Go Bernadette, by Maria Semple, and This Is Where I Leave You, by Jonathan Tropper. Summer reading! 3. Fruit-filled pies, homemade popsicles and real vanilla soft serve with extra sprinkles. I know that this is actually three things and not one, but this is my list and I do what I want. Incidentally, I want ice cream. 4. Camping! …No I’m totally kidding. I haven’t been camping since I was 13. I like s’mores, though. 5. Sandwiches. When the heat of summer beats at your neck (and the sweat starts to drip in places that don’t like to be sweaty), sandwiches become the best kind of meal. They keep your kitchen cool and your face full of summer’s best produce. There’s the classic tomato sandwich, of course, the merits of which have been discussed by many an enthusiastic blogger, but I recently came across this post by Williams Sonoma on the best way to build a sandwich, and my mind started to go places. I realized that, in summertime, there are so many ways a sandwich can go! It comes down to a few things: Sturdy, toasted bread; good cheese; ripe fruit, and a fancy finish (some flaky salt or pink peppercorns, for example). I decided to go open-faced, and let the summer fruit shine bright. Strawberry and burrata. 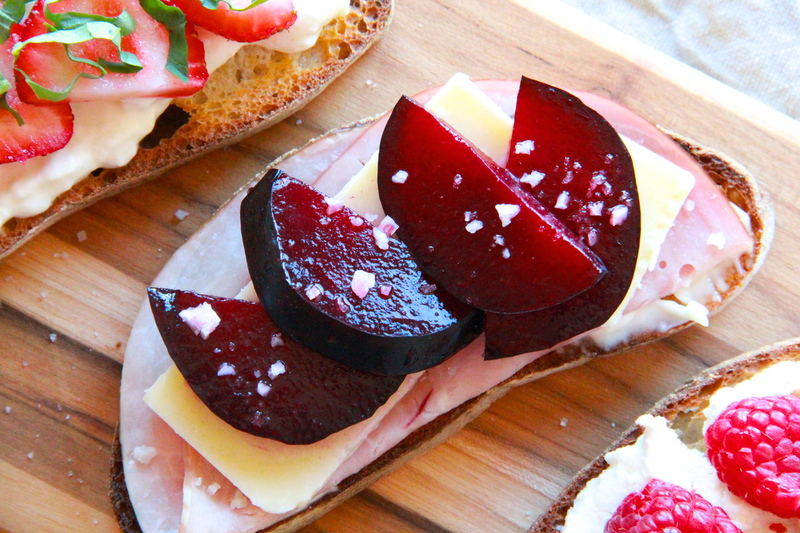 Ham, cheddar and plums. Ricotta and raspberry! Sandwiches don’t really need recipes, I know. These little guys are just jumping off points for you and your favorite summer flavors. So this weekend, check out your local farmer’s market, pour yourself a glass of something cold and bubbly and get into summer. With sandwiches. For all of these open-faced sandwiches, start by toasting the ciabatta until crisp and golden, then simply top the toasted bread with the listed ingredients for each variation (starting with the cheese or mayonnaise and ending with the special salt or pepper). Enjoy immediately. Summer sandwiches for all! I wish it was summer here! We are in the midst of bleakest winter. Wow, thanks Roxanne! I’ll work on that donation button asap 🙂 Thanks for saying hello! I love-love-loved Where’d You Go Bernadette? 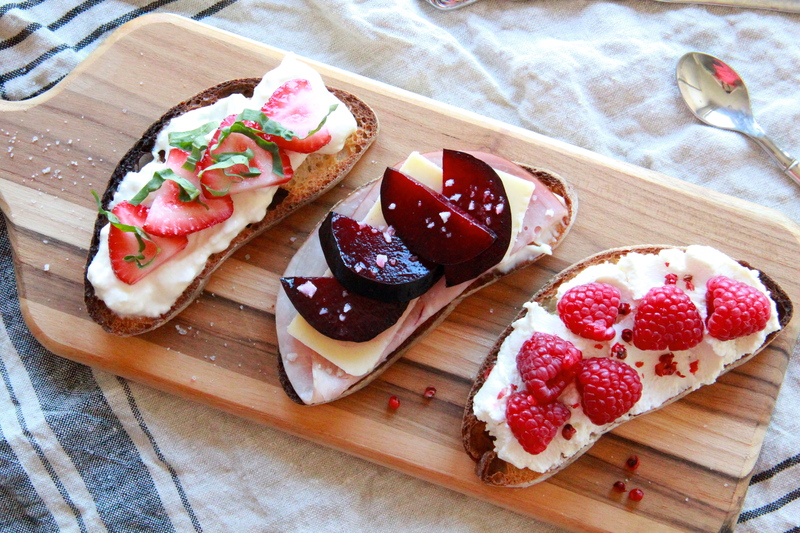 Open faced sandwiches are up there too, though and yours look awesome. I’ve been making something like this for breakfast – crusty walnut raisin break, yogurt and sliced strawberries. oh YUM — love the idea of your breakfast version! These look fabulous!!! Perfect fit for the blistering heat we are having in Minneapolis right now. and I read Where’d You Go Bernadette and loved! This! This. We need to make this. 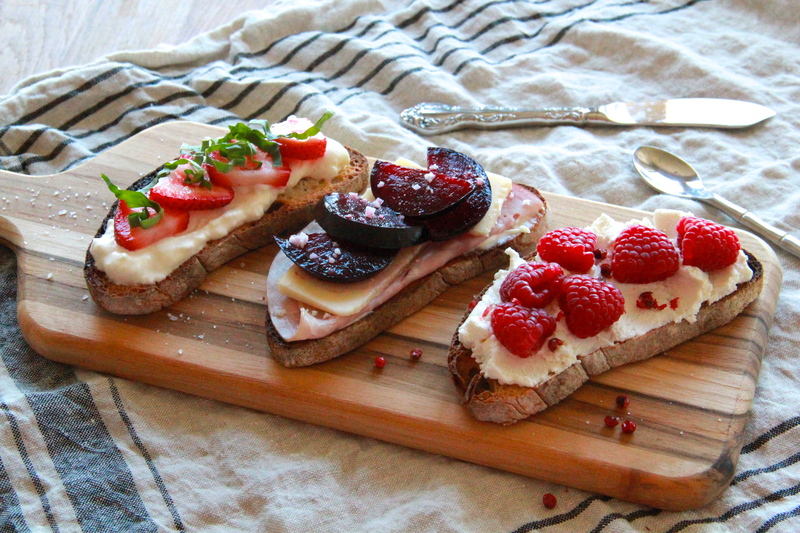 I just about die for anything open faced and bruschetta-esque. SO YUMMY!